Ben drove up, and saw Theo inspecting his tomato field. 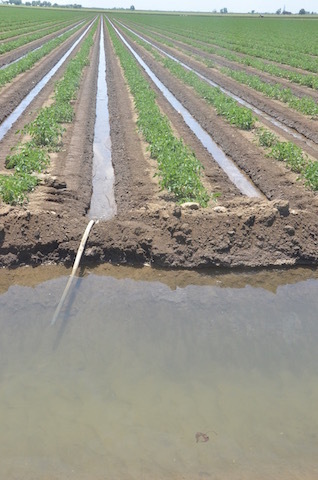 It was the second planting, which they had just been finished thinning, and about ready of another irrigation. The plants were big enough now, to where Theo did not sprinkle anymore, but ran water in every other grove between the beds. It was the end of March and they had just a sprinkle of rain, which did not amount to anything. “Got to go, we’ll continue this conversation later,” said Theo as he got in his pickup to go and prepare for the next irrigation.